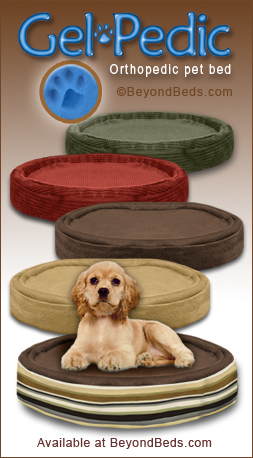 Gel-Pedic pet beds are designed to give your pet maximum comfort and pressure relief. The unique Gel Foam molds and shapes to the contours of your pet's hips and joints providing superior pressure relief for aging, ailing and arthritic pets. 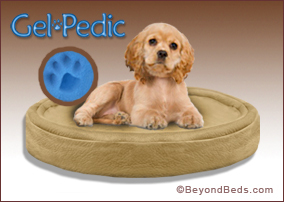 The Gel-Pedic orthopedic pet bed has three unique properties that set it apart from all other pet beds. 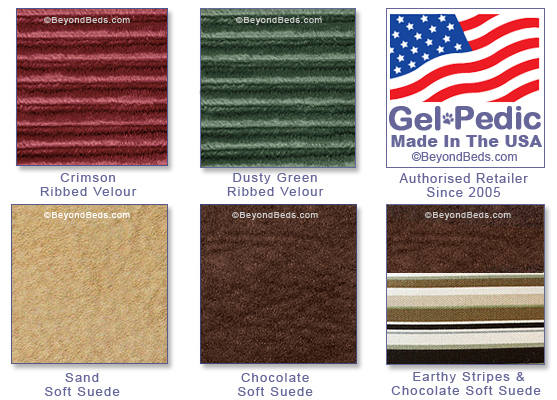 Patented high quality 6 lb GelFoam, Repel-a-Flea with natural eucalyptus to repel fleas and mites (optional) and a natural nesting shape for pet's security and comfort. The properties of the Gel Pedic pet bed work in accordance to the laws of thermal equilibrium. When two objects are in thermal equilibrium they have reached the same temperature. During the process of reaching thermal equilibrium, heat is transferred between the two objects. It is understood that the denser an object is, the faster the heat transfers through it. Your dog's natural body temperature is between 101°F -102°F. If your pet's body is cold during the winter and the exterior temperature is dramatically cooler, the GelPedic bed does an efficient job of insulating your pet as the cold travels slowly through the dead air space in the GelFoam cells keeping the bed warm. The reverse is true for the warm summer months. When your pet's body temperature is warmer than the pet bed's outer surface of the bed (which is at room temperature), the GelFoam will naturally draw heat from your pet's body much faster than other bedding materials, thus keeping your pet cool in the summer. GelPedic pet beds offer the ultimate in comfort, the needed temperature balance, and aromatic freshness using natural eucalyptus to repel fleas, mites and ticks from your pet's bed. The GelPedic pet bed provides a patented natural pre-nested shape that allows your pet to sleep in a curled up position, providing superior comfort and security. The GelPedic pet bed is only 3.5 inches tall, so pets with sore joints or hips can easily get in and out of the bed. Important Note: It is extremely important to measure your pet lying down from nose to rump before ordering your GelPedic pet bed. All GelPedic Pet bed sales are final because returned beds cannot be resold. Click Here for a size chart that will help you to choose the correct size Gel-Pedic pet bed for your pet. Leak Liners are recommended if your pet suffers from incontinence. Click Here to purchase replacement covers.